Here's a guide on how to install mods. This guide assumes you know how to navigate web pages and browse through files on your computer. I'll specifically be covering windows as I assume anyone with linux can also figure it out with this information. First, go to the mod release section of the forums. Next, open the thread of the mod you want to download. I'll pick this one. This mod like most will have a link for downloading the zip file. Some though will have a link to a github page where you can download the mod. Click on the zip file to start downloading it. Once downloaded, it'll most likely be in your download folder. You'll want to copy or cut the download and then navigate to the Mods folder where your Vintage Story files are. For windows they are in Username/AppData/Roaming/Vintagestory/Mods. There will be two mods in there as you can see from the picture. That's because the game modes are technically mods. Paste the zip file that you copied or cut, into this folder with the other mods. If you are unable to locate your AppData folder it could be because it is hidden and you are not able to view hidden files and folders. To make it so you can, go to the top and click on View. From there navigate to where it says Hidden items and make sure it's check marked. From this point, you can probably start up Vintage Story and everything will work fine. The next section is common issues you may encounter. The mod is not enabled. Start up the game and go to Mod Manager. From there make sure the mode has a blue box in the top right. not enabled enabled. This is also where you get the mod version number. It's right next to the box and in this case, it's 1.0.0. The game version will be the version number on the Survival Mode mod. 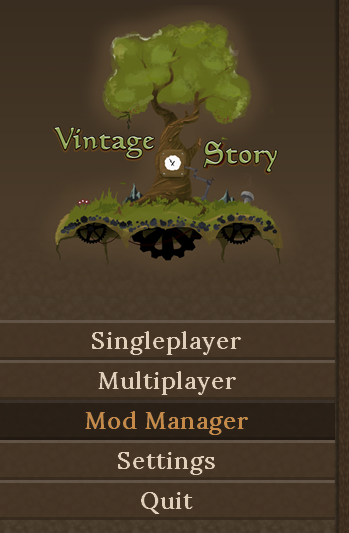 Vintage Story has a fairly fast update cycle and while it's not common for mods to break it can happen. When this happens you'll get an error. To locate the error you'll need to go to your log files which are in Username/AppData/Roaming/VintagestoryData/Logs. You'll want to then go to the mods page on the forums and post what you were doing prior to the error, the version of the mod, the game version you were using(instructions above), and the error file. Here are general guidelines for which file you need. client-crash.txt - when the world crashes but the client doesn't and takes you back to the Vintage Story main page. client-main.txt - when there's a graphical issue but the game doesn't crash. server-main.txt - should probably always be included. Is when things don't work like they should. For instance, a recipe doesn't work. VintagestoryCrash.txt - for when the Vintage Story crashes. 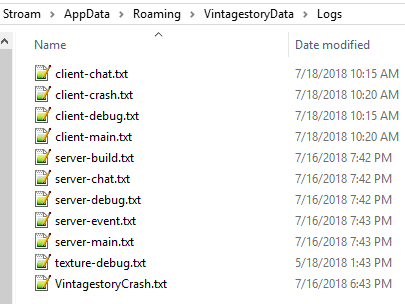 The Vintage Story crash reported will pop up and ask you to report it on the issue tracker because it's most likely a vanilla bug brought to light by the mod. Please include all the information that you would for any error.